This is a comprehensive coaching program developed to achieve the desired result. This process provides accountability, structure, checkpoints, and an efficient way to achieve the results you want. The program provides flexibility based on ongoing feedback. The expected duration is 6-9 months. Input, feedback, and all possible data sources are analyzed and organized into meaningful and useful information to form the basis for setting goals. An initial broad goal is created. Example: Improve Leadership Skills, Better Communication, Higher Performing Team. After the analysis is completed, a report is created on the findings and presented to the client. Specific targeted and measurable coaching goals will be identified that are in support of any larger coaching program goal. The coaching goals will be approved or jointly designed by the sponsors. This is where the goal becomes measurable. Examples: Improve communication and confidence with senior executives, Influence project ABC to be accepted and completed, Delegate two projects in next 60 days. Client will be coached on an ongoing basis throughout the engagement. The majority of the coaching will take place on-site.. When it is mutually agreeable, phone or video conferencing coaching may occur. Coaching will be scheduled at regular intervals, typically twice a month throughout the engagement. 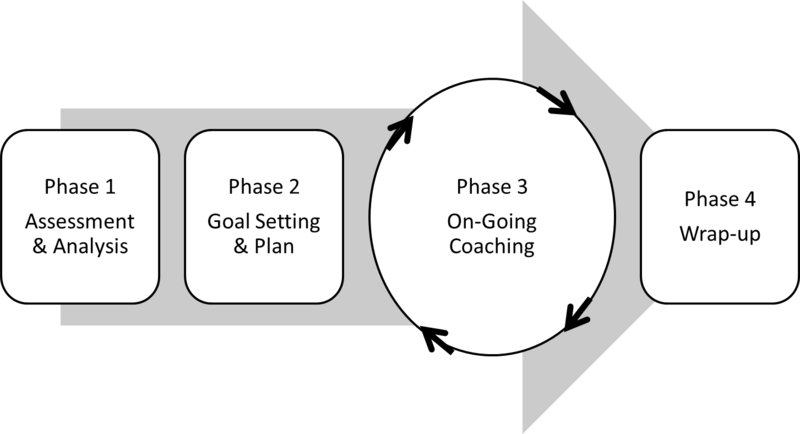 The typical coaching program equates to 12 hours of coaching spread out over 6-9 months, including the initial assessment review, the midpoint review, and final report-out. The coach will conduct a brief updates as needed, with interviewees involved in the assessment. This is to gather information about progress and any additional feedback. Client will update the sponsor about their progress. A final progress and status report and suggestions for continuing success will be created. 1: There is a wide varitey of ways we do this. Either an online tool, customized or a combination of both. Contact us to recieve a sample of our on-line tool. If customized, the interview questions will be provided by the coach and approved by client. The coach will interview approximately 8-12 identified participants. Interview candidates are managers, peers, and direct reports who can give useful, specific, and confidential feedback. Each interview will be approximately 30 – 45 minutes. Our preference is to be able to conduct the interview on-site.